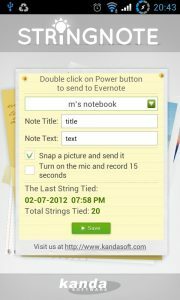 Published by Kanda Software, Stringnoteis a great looking Android app which interfaces to your Evernote account to conveniently send a photo or 15 second audio clip to an Evernote notebook of your choosing. 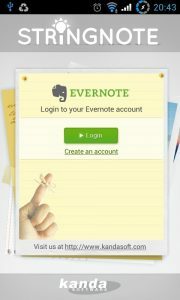 Evernote is a popular suite of software and services designed for notetaking and archiving, with the ability to sync across all devices via the cloud. 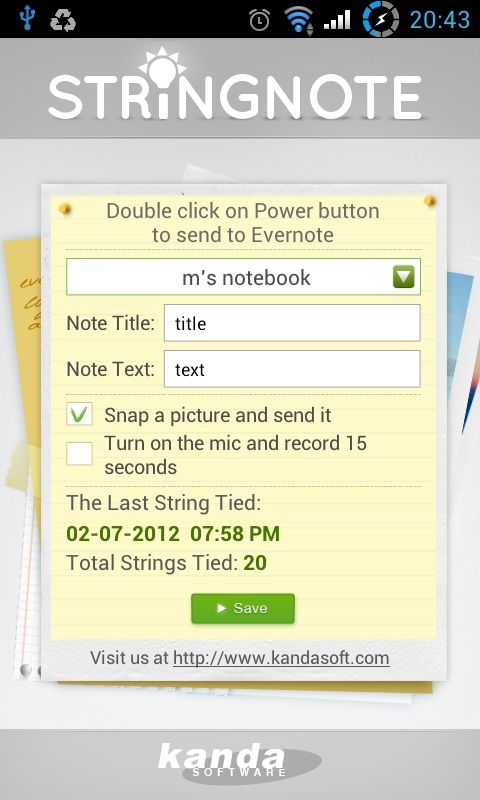 A “note” can be a piece of formatted text, a full webpage, a photograph, a voice memo, or a handwritten “ink” note. Have you ever wished to be able to grab your phone, and just take a photo or record an audio note without having to unlock your phone, scroll through screens, open Evernote, and then record a note? 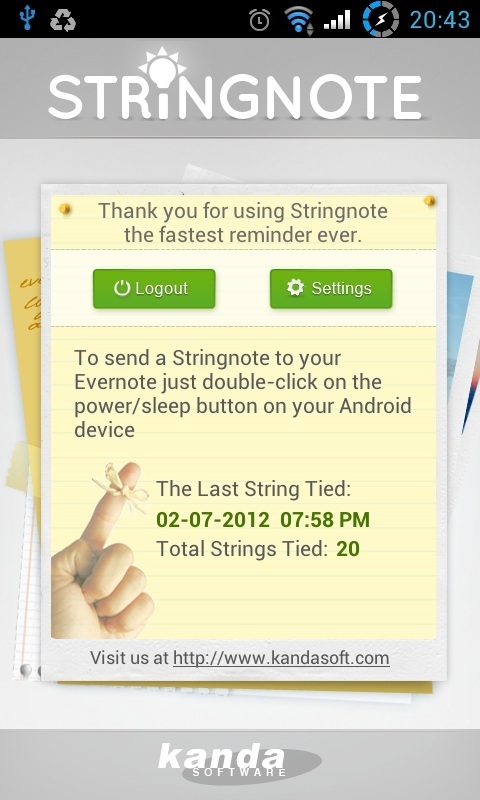 The beauty of Stringnote is in its seamless integration with both Evernote and your phones external power or sleep button. Regardless of the state of your phone; locked, unlocked, or even in another app, Stringnote allows you to record a note (or ‘String’ as Stringnotecalls it) instantly to make sure you don’t miss that crucial moment or waste time. 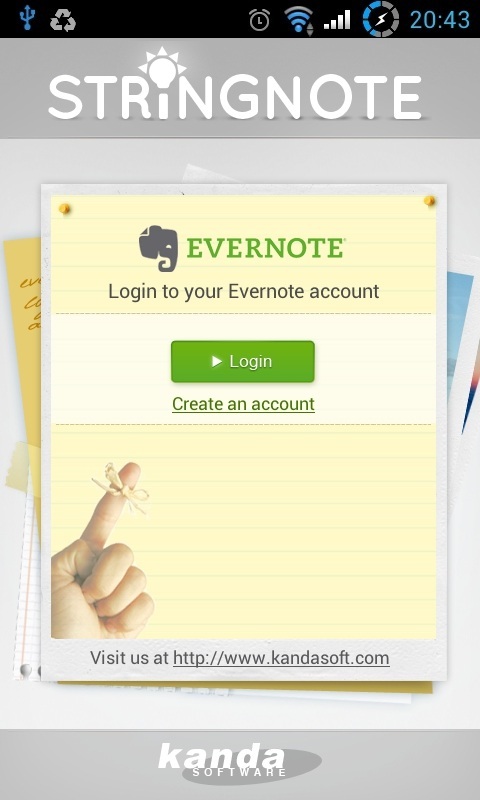 Opening the app for the first time asks you to sign into your Evernote account, or sign up for one. Once signed in, each successive opening will take you to a simple and useful page which allows you to logout of the current linked Evernote account or change your settings. The front page also provides you with instructions on how to use the app as well as details of how many ‘Strings’ you’ve tied and the details of the last ‘String’ tied. The settings page allows you to set what the app does each time you double click your power/sleep button. You have the choice of which notebook to sent the notes to, what title to give the notes, what note text, and if you want to record a photo or 15 seconds of audio. Stringnoteis extremely easy of use with practically no learning curve. Setup is simple and efficient, screen layouts are visually pleasing, and overall a very polished product. I gave Stringnote a good workout and am happy to report I didn’t encounter a single bug. 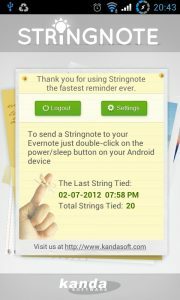 Some of the greatest apps are also the most simple and Stringnote ticks all the boxes and is an app which is a must have for all Evernote users. We hope to see more well integrated apps from Kanda Softwarein the near future.